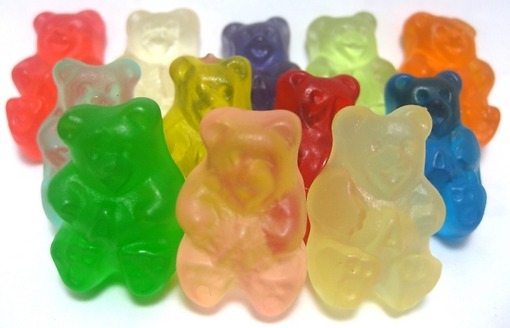 Great Gains and… Uhhh Gummi Bears??? Did I just say that? Okay, okay… I must confess. I have a sweet tooth. However, they say (and I don’t know who they are) that timing is everything. Here’s a case where the timing works out perfectly to my benefit. What I’m talking about is my post workout shake. Before going into details, let’s just consider for a moment why we have a post workout shake in the first place. It’s so we can immediately cheat after a good workout and not feel guilty. Right??? 🙂 In actuality, it’s to replenish and repair muscle tissue after an exhausting workout. Here’s how it works. With resistance training, glycogen is taken from our muscles through a process called glycolysis and converted into either pyruvate or lactate (depending on the oxygen available) to then be converted into adenosine tri-phosphate (ATP) for energy. As we continue to exercise and deplete the glycogen, fatigue sets in and eventually muscle failure. As we fatigue and rest between sets our body releases insulin blocking hormones such as: human growth hormone, epinephrine, norepinephrine, glucagon, and cortisol. Their main job is to block insulin from storing glucose as well as breaking down muscle tissue to convert into energy. So, here is where our shake comes in and timing becomes crucial. As we finish our last set, we still have all these hormones floating around blocking insulin. If we drink our shake immediately, the insulin blocking hormones will inhibit insulin from doing its job, which is taking glucose and amino acids (protein) from the blood stream and putting into muscle tissue and the liver. If we wait 20 minutes however, the body stops secreting these hormones and they dissipate. This is now a perfect time to load our body up again with glucose and protein and is where the replenishing and repair takes place. So, 20 min. post workout, taking 60 – 70 grams of high GI carbohydrate (sugar), glucose levels spike in the blood stream and insulin is released where it sticks the glucose right back into our muscles for later use. During this anabolic window, the sugar is not stuck on our sides as fat because the body needs to refill the glycogen storage in the muscles immediately. The insulin will also pack everything else needed into the muscle cells, like: Protein, branched chain amino acids, creatine, etc. If you wait much longer than 30 minutes to drink your shake, this window of opportunity begins to close and you will not receive full benefit from it. So… 20-30 min. is optimum. Here is the recipe for the post workout shake that I drink. I change it from time to time but this has been effective for me. 2500mg Conjugated Linoleic Acid (CLA – capsule) a host of benefits, including: aids insulin, fat loss, anti-inflammatory, etc. 12. 1000mg Vitamin C (1 pk EmergenC) Antioxidant for free radicals released during exercise. Stick it all in a blender and Enjoy!!! Keep in mind, this shake is to be used after a workout where muscles are fatigued to or near to exhaustion. Drinking this as a regular drink throughout the day will get you fat by spiking glucose levels when your body doesn’t need it!! So if you have a sweet tooth, use this window of time post workout and fuel up muscle cells by grabbing some Gummis, A Pixie Stick or a high GI (glycemic index) candy (no nuts or fillers please). To avoid a crash from the high carbs, eat your post workout meal somewhere around 30-45 min. after your shake. Until we meet again… Love your life and live it without limits!